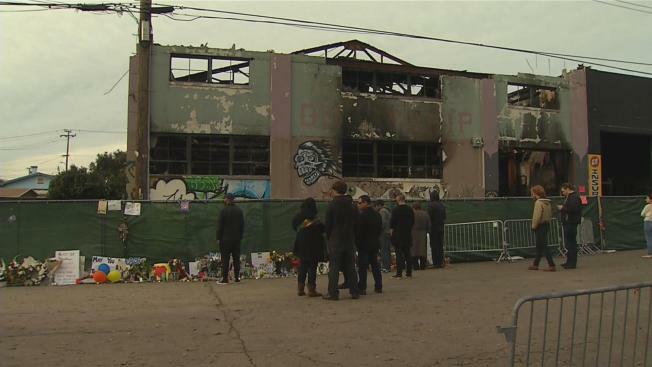 The San Francisco arts community and city leaders are intent on prevent another disaster like the one that killed 36 people at the Ghost Ship warehouse in Oakland last month. To that end, artists, fire officials and building department employees gathered Tuesday at the Brava Theater to discuss ways to improve fire safety. The workshop, which was expected to attract roughly 100 people, was hosted at the Mission District theater because artists who live and work in warehouses are now afraid of being raided by fire marshals or evicted by their landlords. “I got as many fire extinguishers as they have. I got power cords that have circuit breakers,” housing activist Spike Kahn said, while rolling a shopping cart out of Discount Builders Supply. She said she planned to hand out her purchases at Tuesday’s meeting. She is not a newcomer to the cause. Kahn has financed the renovation of 20 artist studios inside a 6,000-square-foot warehouse next to a condo development in the Mission District. “As a result of a lot of political pressure, the developer was forced to provide this art space as a community benefit in order to get his luxury condos,” Kahn said. The studio space in question has all the bells and whistles missing from the Ghost Ship warehouse, which officials found lacked smoke alarms and sprinklers, and was not permitted for use as a residence – only a warehouse. Kahn said she’s been leaning on officials to create more live-work spaces for artists across the Bay Area. A lot of artists can only afford to live in warehouses like the one that burned down in East Oakland on Dec. 2, she said, because it isn't feasible for them to shell out the Bay Area's astronomical rents. But now they feel trapped between fire officials who would kick them out and landlords who would do the same. “The problem is, as soon as the Ghost Ship fire happened last month, landlords were using that to start evictions,” Kahn explained. She said Tuesday’s meeting is aimed at preventing that from happening by getting fire safety information to the people living in warehouses, without tipping off city fire marshals and alarming landlords. “We are not going to say where we have our studios, we're just going there to get information,” Kahn said.